The south side of the Market Square is dominated by the mighty building of the Parish Church of St. Dionysius. 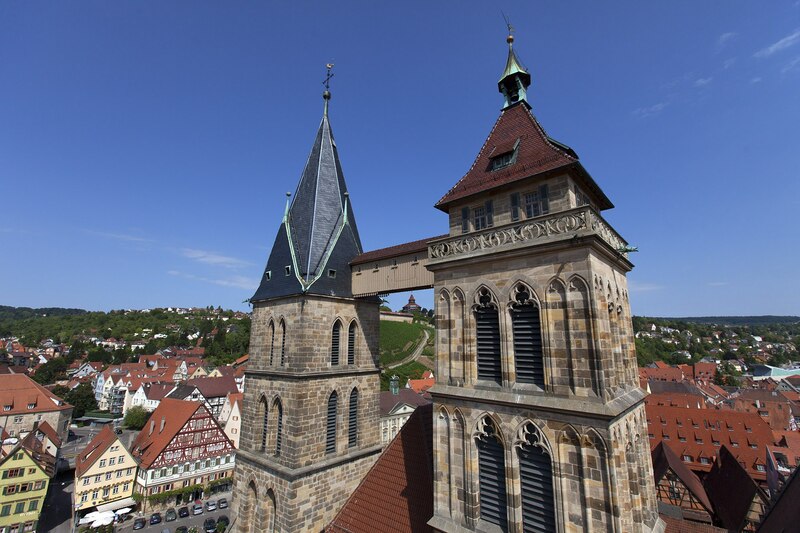 It was here that the history of Esslingen began in the year 777. The present church is the third building on this site. In the 13th century, when the town was flourishing and becoming wealthy, its citizens made the importance of the town visible with this impressive new building. The basilica with its three naves and high choir was built between 1220 an about 1315. The architectural style is the transition from Romanesque to Gothic. The magnificent stained-glass windows in the choir from about 1300 are the church's greatest treasure. They are among the most important and most beautiful medieval stained-glass windows in Germany. The bridge connecting the two towers is very prominent from afar. It dates back to about 1600 and was necessary for structural reasons.